Back to the Essence: Tracy Morgan Returns to Bed-Stuy Community Garden to Kick Off 2nd Season of The Last O.G. 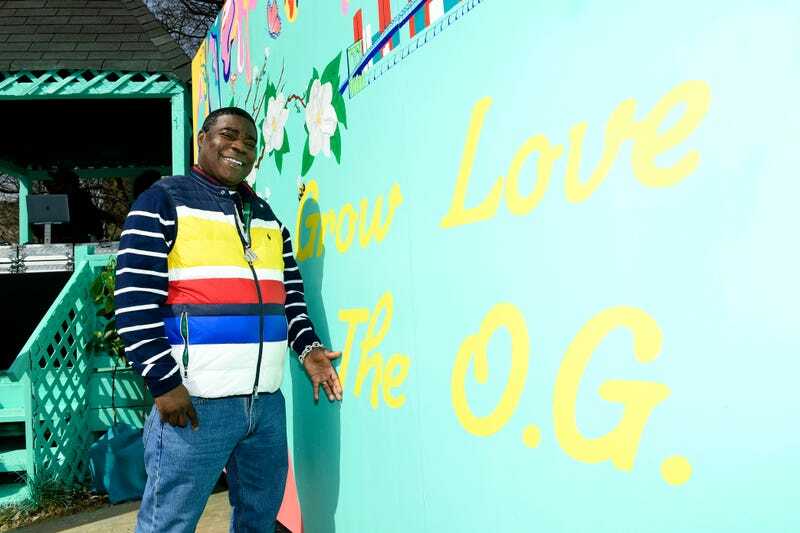 Tracy Morgan at the Garden Party for Good at the Hattie Carthan Community Garden in Brooklyn, N.Y., March 28, 2019. The Last O.G., the number one show on TBS, is heartening, sly and oh-so-real. It portrays in popular culture the collateral damage of mass incarceration—the lost time, the regrets, the broken ties, yet, the thing that makes The Last O.G. so compelling, so irresistible, is that it wraps that heavy, weighty reality in levity and grace. Plus headliner Tracy Morgan is hilarious. To kick off its second season, which premieres Tuesday night on TBS (the series is executive produced by Jordan Peele and co-stars Tiffany Haddish), Morgan and his family trekked back to Medina—his home town in the planet of Brooklyn, where the show is shot—to the Hattie Carthan Community Garden in Bed-Stuy. Morgan dug into a little earth, mixed and mingled with fans and community members who got to check out grassroots organizations like environmental city outfit, GrownNYC; Drive Change, which hires formerly incarcerated youth and trains them to work in New York City’s top restaurants for a living wage (their gumbo that day was divine); and City Harvest, a food rescue organization, which encouraged visitors to the garden to volunteer for families in need. When Morgan addressed the crowd, he touched on his near death experience which, he said, made him a better man. He had a gaggle of young teens come up to take photos with him and told the crowd again and again that he loved them. Tracy Morgan, Maven Sonae Morgan and Megan Wollover, at the Hattie Carthan Community Garden in Brooklyn, N.Y., March 28, 2019. Tracy Morgan, his daughter and some kids from the neighborhood. The people of Brooklyn, N.Y., March 28, 2019. First time muralist Tiffany B Chanel, March 28, 2019, Brooklyn, N.Y.
Tracy Morgan on March 28, 2019. “I promise you I’m not going to ever leave you. Be good. I love you, and you heard that from me,” Morgan said to the kids. “When we see each other in the streets, let’s act like we know each other, alright? That’s the problem with my community, we became strangers. Look at all of us in here right now. I cried last year when we did that in Marcy. We haven’t done that in a long time. We have food here, music. The DJ, he ready to spin. Let’s do this. I ain’t going nowhere. Let’s have a good time,” Morgan said, with much sincerity. The premise of The Last O.G. is the story of so many millions of black men coming home and not only navigating their rapidly gentrifying communities, but relationships with their children and families, and even technology, after spending a significant amount of time “away.” It has to resonate for the estimated 25 percent of African American children in this country who have a parent who is currently or formerly incarcerated. And what was evident on Thursday was that not only was Morgan all about second chances, but first ones as well. Several young actors on the set that day — including Jeremiah Craft, who plays teen Tray, and young Joshua Rivera — are in their first break out roles in the series. Another first timer who got a shot is a young woman from Brooklyn who created the mural for the community garden, Tiffany B Chanel, 31, who says that the mural is her biggest work to date. First chance, second chance — it’s all about the humanity of so many of those who are behind the proverbial eight ball. The Last O.G. premieres Season 2 tonight, Tuesday, April 2, 10:30 p.m. ET/PT.